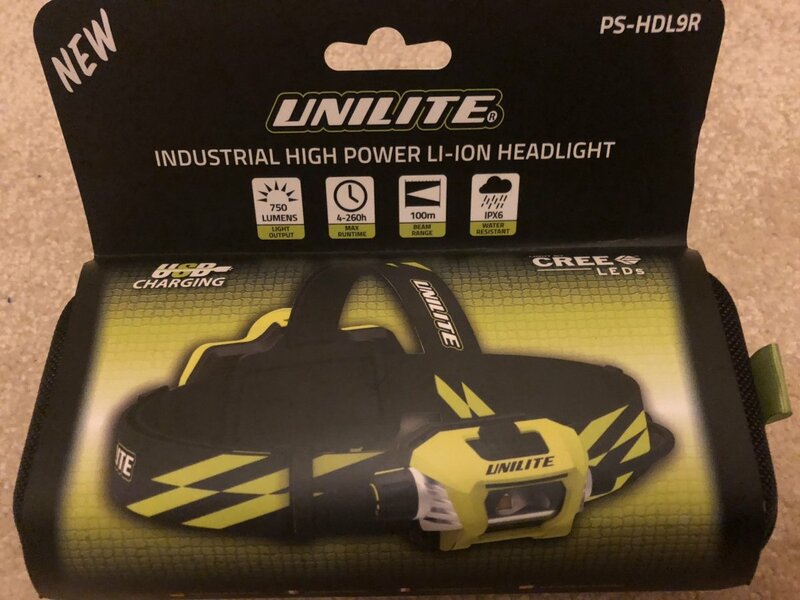 .I recently won a Unilite PS-HDL9R head torch on a competition on Twitter and I’ve been looking forward to testing it properly and reviewing it for the benefit of others looking to buy a head torch to light up their Autumn/Winter walks or runs. When we’re coming into the time of year where it’s dark in the morning and dark when we get home from work. This generally means one thing – hi-vis and head torches. Personal safety is always paramount for runners especially when daylight is reduced. Many of us aren’t blessed with adequate street lights so a head torch is an essential piece of kit to allow us to continue to train in the dark. I have a head torch that was a freebie in the goody bag of the Paris Marathon a few years back. Using it on a run isn’t brilliant as it barely covers the area around my feet so it was good to see how the Unilite model would be. In order to make this review effective, I’m going to compare other head torch reviews from running chain Run and Become and Expert Reviews. To test it, I went for an early morning run off-road near to where I stay as there would be no light and the conditions meant there would be no natural light from the moon. Torches are measured by the number of lumens, which determines the level of brightness. The more the lumens, the more lit up the path will be. The most popular model on both the sites is the Petzl Tikkina which has 150 lumens. The Unilite has an incredible 750, so it’s bright! You can still see very well on half beam so you won’t necessarily need to have it on full beam every time. Another good feature this one has, which most of the other don’t have, is a rechargeable emergency red rear LED light. This will be good for those who run along country roads. This is important as you don’t want the batteries running out mid run and have to fumble your way in the darkness. The life depends on how bright you set the light to and the Unilite model lasts between 4 and 260 hours and appears to be greater than its competitors as the best of the Petzl models lasts for up to 60 hours. The batteries can be found beside the regular batteries in the supermarkets when they need replaced. Unilite claim the beam distance covers 100m, which is more than the average torch listed on the Run and Become site, and I would agree with this as when I ran across the longest stretch of track, it did light up a good distance ahead. This means that you don’t need to alter your pace because of the limit to the distance covered. Let’s get to the main bit, how much does it cost? The Unilite model costs £86.98 on Amazon, a bit more expensive than the models on Expert Review and many of the ones at Run and Become. When you compare it to the Petzl Nao+ which would seem to be the closest in specification, the PS-HDL9R is nearly half the price. I was impressed with everything about the PS-HDL9R, the easiness of setting up, the comfort in wearing it and the range it offered, even on half beam. The main things for me were the distance it covered and as I like running downhill at speed, would it impact on my ability to do that. I’m pleased to say it passed with flying colours. It’s a bit heavier than the other ones but this is to be expected given what it offers. Even with that extra bit of weight, you barely notice it when you’re running. Ultimately it’s going to come down to how much you want to spend. If you stay in a remote area with no lighting and want to run on the road then I would recommend this every single time. You don’t want to play about with your own safety.